For some supply chain and logistics functions, rugged wearable computers can be a real boon. At the same time, the cost of managing these devices can be daunting. Too often, rugged wearable computers cost 5x to 10x the cost of consumer electronic devices with one-third features. Are you looking to reduce the total cost of ownership (TCO) on these rugged devices? If yes, you are not alone. What is a rugged wearable computer? Rugged wearable computers are devices that are worn by users in their arms while performing various functions, like picking and packing in a warehouse setting. Wearable computers provide hands-free way for users to operate the data collection device thereby improving the productivity and efficiency of users. Wearable computers have been in the market since mid ’90s and have been proven to improve the efficiency and accuracy of operations. One of the biggest challenges is the lack of options for customers wanting to buy a rugged wearable computer. If you are in the market to purchase rugged wearable computers, you only have two options: Motorola Solutions and Honeywell. This duopoly has allowed Motorola Solutions and Honeywell to virtually control the market. A problem with lack of competition is that there is no pricing pressure on the incumbents. Unlike every other electronics segment where prices have drastically reduced over the years, manufacturers of rugged wearable computers have held their prices. As an example, cost of an Outbound Systems 9 LBS laptop with 40 MB hard drive (note: hard drive not RAM) was $3,999 in 1990. Now, you have multiple options to buy a sub $300 laptop with hundred times capacity compared to the Outbound Systems laptop of ’90s. In comparison, the costs of rugged wearable computers have held their prices in $2,800 to $3,500 range since mid ’90s despite reduction in component prices. A second problem with current rugged wearables is the relative lack of innovation and device advancement when compared to consumer devices. As an example, the weight of Symbol WWC 1000 from the ’90s was 11.3 oz. and the weight of the latest Symbol WT4000 series is also 11.3 oz. In comparison, the first generation Apple iPod Touch released in 2007 weighed 120g and the latest fifth generation iPod Touch released in 2012 weighs 88g. That is close to 30% reduction in weight in 5 years. This reduction in weight is in addition to increasing the memory capacity, increasing the screen size, adding back and front cameras and other new features. The device advancement and innovation can be directly correlated to the amount of R&D dollars spent by consumer electronics manufacturers and rugged device manufacturers. Apple, for example, spends about $3 billion in R&D in 4 categories of products. Motorola, on other hand, spends about $1 billion in R&D on almost 30 different categories of products and services spanning hundreds of different products. The focused R&D spend in the consumer electronics segment driven by the fierce competition is driving the innovation we see in consumer devices. Most of the technology based devices and applications have their origins in business environments. They were first developed for business applications and then gradually launched in consumer markets. That is until recently. Since the introduction of Apple’s iPhone, the consumer electronics industry has driven the advancement of technology devices. Now, many consumer devices are finding their way into enterprise environments. Consumerization is the “growing tendency for new information technology to emerge first in the consumer market and then spread into business and government organizations.” Consumerization of IT is everywhere and more and more businesses are adopting their policies and processes to support this trend. According to IDC Research released in 2012, “iOS will be the top operating system in the enterprise among companies that deploy mobile products to employees.” Many companies, from Kraft Foods, Sunbelt Rentals, D.W. Morgan to Lowe’s and GE are deploying consumer devices in their enterprises. But, even with all the promise and advancement of consumer devices in the business environments, these devices lack some of the core needs of warehouse and distribution center operators. 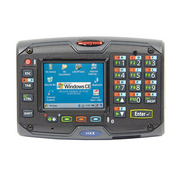 In Command Wearable is a ruggedized consumer electronic device tfor use in enterprise environments as an alternative to the rugged wearable computers like Motorola WT4000 and Honeywell LXE HX2. In Command Wearable has a consumer electronic device, a proprietary ergonomic rugged enclosure and intuitive set of apps to enable the consumer device to be used in warehouse and distribution environments. The first generation of In Command Wearable will be using Apple iPod Touch 5th generation as the core computing device and will be paired with a Bluetooth ring scanner for data capture. The time is ripe for consumer mobile devices to enter enterprise environments such as warehouses and distribution centers. With appropriate rugged enclosures and intuitive apps, consumer devices like Apple iPod Touch can not only replace the existing rugged wearable computers but also provide additional capabilities that warehouse and distribution center operators can leverage.